Today brings a surprise: For the first time this year, I hear the spring birds chirping. There is one bird in particular and I do not know what it is, but it chirps two notes, one slightly lower than the first. It is out there singing. Weather minded as we are in Buffalo everyone has passionate opinions about things like snow and spring. I have always considered St. Patrick's Day the official start of spring. Sometimes we are standing there bundled up and sipping whiskey to keep warm as we watch the shivering little girls from the Woodgate Irish Dance Academy out there hoofing it, but it is spring! So that is my opinion. However there is also the theory that St. Valentine's Day is the start of spring. Or more accurately the end of winter. The bird outside seems to agree. If that is true I would say anyway that I saw the winter out in style. Last night my Valentine's dinner was a success. I made Bouillabaisse. Ha, ha! Look at that, I can finally spell it. I did a lot of Internet searching for it over the weekend, is why. 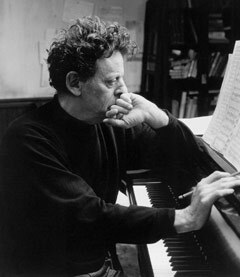 ... being a minimalist composer, ever has a party and calls it "The Minimalist Entertains." If he does, I recommend this Bouillabaisse. It is a keeper! It calls neither for fish stock nor for bottled clam juice. It took about 15 minutes and then it sat for a while which improved it. Then you toss in the fish which in our case were lobster, mussels, haddock and shrimp. Meanwhile his menu that included the Bouillabaisse suggested a Free Form Apple Tart for dessert. Seeing that the Bouillabaisse was easy I thought, what the heck. And I made the Free Form Apple Tart! I still managed to be disorganized enough so we did not eat until 10 p.m. or something -- not as bad as it sounds, as our target time was 9 p.m. But the good news is, dinner was a success. We listened to Nat "King" Cole on the 1950s stereo. I listen preponderantly to Capitol Records albums because that was Leonard Pennario's label when he was not with RCA. Howard brought me tulips from Pro Flowers. First tulips and today, the spring birds. The down side is, it might be time to take down my Christmas tree. Spring may just be around the corner!